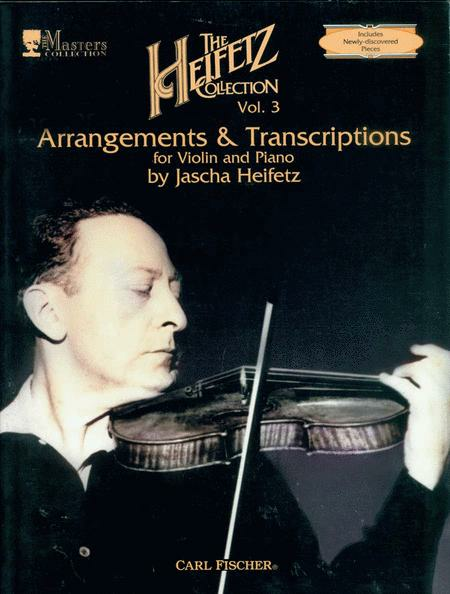 The third volume of the Heifetz Collection is a treasure trove of material for violinists, including many items that have never been published before. Jascha Heifetz (1901-1987) remains a landmark among violinists of the twentieth century, a performer who virtually redefined the limits of the possible for his chosen instrument. These transcriptions and arrangements, made to enrich his repertoire, will be a great boon to young virtuosos looking for a challenge. Many of them were provided by the Heifetz family and are published here. Music by Albeniz (Sevilla), Castenuovo-Tedesco (Ritmo di Tango), Debussy ( La chevelure), Faur? (Aubade), Kodaly (Danube-Tisza), Prokofieff (Gavotta, Op. 32) among others are included in this handsome collection, which is a must purchase for players and lovers of fine violin music.